NOTE: This interview has a lot of questions asking for descriptions of the film simply because I've never seen it. Hudgens noted that he does not plan to release the film over the Internet or via the usual tape-trading channels because he wants to avoid bootlegging problems like the ones that Troops has had. The fear of illegal copying is an understandable one, since this has long been a fan-favorite at conventions; by all accounts, mixing Star Wars footage and the audio from the classic Daffy Duck cartoon, Duck Dodgers In the 24 1/2 Century appears to have been a stroke of genius. How old are you, where are you based out of and what do you do in real life? I'm 32 years old, and in real life I'm the Senior Promotions Producer for the WB affiliate in Knoxville, TN. I do all the on-air graphics and animations, as well as most of the promo work for the station. I've also done similar jobs for the Fox affiliates in Knoxville and Nashville, as well as corprate video for General Electric Lighting Systems. How long ago was the movie made? The original version was started in 1990, but finished in 1991 while I was working for GE. The current version (I called it a 'Special Edition') was done in 1995. They're basically the same, just snazzier graphics and letterboxed transfer on the SE--which I did before I knew Lucas was planning on his SEs! What was the inspiration for crossing over the two movies? My friend and mentor, the late J.J. Johnson. He was a kind of video guru in Southern fandom. He was the educational media coordinator for the University of Tennessee, and this was (as he put it) a brain fart he had one day while we were having tea in his office. We always sat around and talked film and cartoons. He was killed not long after that, so he never saw it finished, but the piece carries a dedication to him. 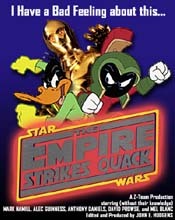 Is the film soley Star Wars footage with Duck Dodgers lines, vis-versa, or a mix of both? It's completely the audio of the Duck Dodgers short. the visuals are mostly footage from the three Star Warsfilms, except for the credits and two other shots. I did my own version of the alphabetical planets, plus recomposited the last shot of Porky and Marvin hanging together over a new widescreen background. All of Daffy's lines are "done" by Luke Skywalker (the lip-sync is close, but not great, although sometimes it's so spot-on it's eerie). Threepio covers Porky Pig's lines, Dr. I.Q. High is Ben Kenobi, and Marvin the Martian is, of course, Darth Vader. His reveal is one of the biggest laugh-getters. Which film's story does your film adhere closer to (if at all)? Continutity? Hah! Seriously, though, it bounces from film to film at a whim--whatever matches the dialogue or sound, and seemed funny. Same as the cartoon--about seven minutes. How long did it take to edit, and what kind of equipment did you use? How long, I don't remember exactly anymore. The original was done in fits and starts over a period of a year. At the time, I was bouncing between school and the co-op job at GE in North Carolina, so I mainly fiddled now and then. The SE was done in my spare time (usually in the evenings) over a two-week period. The original was edited from VHS on a both 3/4" and professional SVHS systems. The current version was edited on footage transferred from laserdisc to 1" videotape, and edited on 1" using the AmiLink system with a Video Toaster. It looks really clean, as there was very little generational loss in this dubbing and editing. I read on your site that you made a batch of Babylon 5 rock videos--did Quack come before those? Originally, yes. I think it influenced Joe Straczynski in his hiring me to do the videos, as had seen it and quite a few of the other SF themed music videos I had done for con dance parties before. I had already done the first Babylon 5 video ("Danger Zone") and was discussing with Joe what the second one would be when I edited the SE. Were you involved in convention culture before you made Quack? If not, did Quack sort of enter you into it? I got involved in conventions in 1986 with J.J.'s prodding at a little local con here in Knoxville. J.J. then put me on his media staff for the 1986 Worldcon in Atlanta. We did one of the first major convention networks, with live telecasts, a daily convention news show. We converted two hotel rooms into a miniature studio. It was a major undertaking, but we had a ball doing it. We helped with a lot of the Magnum Opus Cons after that, until JJ died. Probably won't do a sequel, although people have tried to get me to do something similar with Babylon 5 and another WB cartoon. Besides, the later Duck Dodgers cartoon wasn't as good in my opinion, or considered a classic as the first was. Where did you get the cartoon from--taped off TV or a professional video? The cartoon was from a commercial VHS tape. I only needed the audio for the most part, so that was fine. Where did you first show it and what was the reaction? I honestly don't remember. I remember showing it to the Wednesday Night Pizza gang, and they all loved it. I showed it at local conventions. Mike Jittlov got ahold of it after the 1991 DragonCon (it showed there) and called me a fellow wizard--which was pretty heady at the time. Still is! There were tapes floating around for a while after that. I had sort of gotten out of fandom until Babylon 5 came along. We showed it at the 1995 Big Bang convention in Chicago, and then the response was overwhelming. And then in 1996, I got brought up on stage at a Vulkon in Baltimore to a standing ovation and "We're not worthy!" chants from the producers of another short, K'thelma and K'louise. That was weird. Lately, about the only convention I get time for is DragonCon. People beg me to show it during my Babylon 5 presentation there, so I do. And I've got some big fans. Kevin J. Anderson still writes me to tell me what his visitors and guests say about it (he apparently shows to all of them), and I know Mark Hamill and Tony Daniels have got copies. I hear Lucas has seen it, but I've never talked to him or met him to know for sure. Do you have any upcoming screenings? I'm a guest at DragonCon in Atlanta this year again. My Babylon 5 panels have gotten so popular, they put us in main programming, so I'll be showing it there. Maybe during intermission at the masquerade, but that's still iffy.